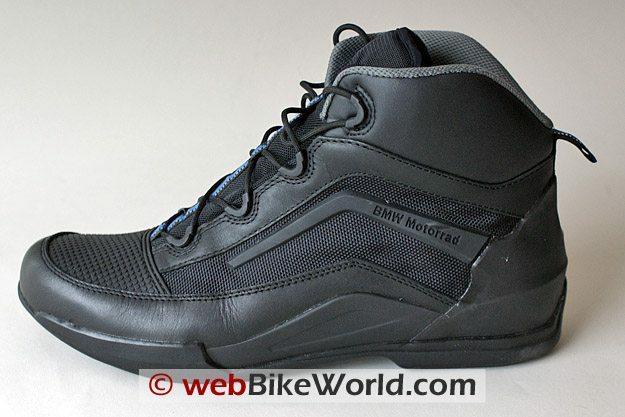 The BMW Street Sneaker 3 boots are comfortable right out of the box. After the outside of the sole hits the ground, there isn’t much sensation of wearing anything. They flex, support and provide pressure exactly where needed, at least for my foot. A small premium will be paid: I for one have never regretted it. Best of all: no 1000 km or 620 mile break-in for these puppies. If you are still looking for a lightweight sneaker-style boot, with good support and good looks, try a pair, I’m sure glad I did. I have been casting around for a light pair of paddock style boots that would provide the minimum protection, support and comfort needed once dismounted for the day, or when playing tourist. An aging pair of light weight Ducati walking boots have worked relatively well for three years, but they don’t provide the overall support that I preferred in case a long walk, or short ride, was in the offing. Having tried several various pairs of lighter weight boots from several manufacturers, it was hard to decide between a heavier boot that gave up some walking comfort or a lighter pair that would likely be good for casual use, but not provide any overall protection. I haven’t seen the Icon Tarmac boots (review) up here yet and most of the other boots on my short list are not available, for varying reasons, in my size (a perfect 46). So when the accessory manager at Ottawa Motorrad offered to get in a size 46 pair for me to try, it was a no-brainer. BMW clothing and other accessories can be very hard to get, at any time, but especially this time of year and especially if not ordered early on. Sales of BMW motorcycles and BMW accessories have remained healthy this year despite down turns in other areas of the industry. So between continued sales and long lead times, a lot of desirable items are either ‘out of stock’ for the season or just not available, probably not until next year’s orders are placed. 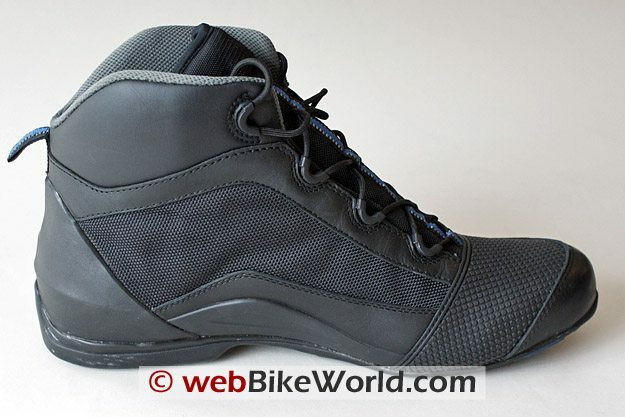 The Sneaker 3 Boot is a product developed by BMW under the C.A.R.E. or Concept of Advanced Rider Equipment safety concept. Made of leather and fabric in basic black the Sneaker 3 Boots are pretty low profile, in shape and in terms of catching the eye. I find many other light or medium weight boots, although being well made and functional, are clunky or chunky in appearance and feel. This is typically due to add-on styling features: good for some, but not for me, at least in footwear. The ankle high basic black boots feature a reinforced heel and toe. TPU foam is used to provide side arch support and full protection on the sides around the ankles. The boots are on and off in seconds thanks to a simple lace-up approach. A two-tone rubber sole provides support and absorbs vibrations. Each boot has a raised-welt pressure pad across the top front…so whatever side the shifter is on, the boot is well protected and the pad absorbs pressure from the shifter as well. A narrow retro-reflective strip is stitched down the centre of the tongue and the back pull tab is also a retro-reflective item. The removable insoles provide good support in the right spots for my feet. My foot is rather narrow and I typically end up buying a top-end pair of insoles to use in my riding boots. But, so far, so good, the standard insoles are working just fine. They can be removed for replacement or washing. The boots feel light and at 550 grams each or 2.4 lbs. for the pair, they are. They are just slightly more than either pair of my walking and jogging runners, which admittedly are not the lightest on the market. The BMW boots are actually lighter than my older and lighter-framed Ducati paddock boots. While it is typical (expected) to see Beemer riders and their passengers faithfully adhering to the ATGATT principle, some down time is permitted. And when off the bike, something like the Sneaker 3 Boot is sure to attract those looking for easily packed and comfortable walking apparel. This assumption is borne out by the fact that that sales of this model have been quite brisk, which is one reason why my size was not in stock, but had been earlier in the year. A couple of current owners were able to confirm that the ‘sneakers’ were indeed everything claimed and at the top of their list was overall comfort. My first full day of wearing them, ostensibly to break them in, resulted in the feeling that, well, they were broken in. And after almost a week of use, I haven’t given them another thought, except to note that they are extremely light, supple where needed and really, really comfortable. A short ride around our neighbourhood on my F800GS served to validate the fact that the boots do flow air, quite well thank you and, provide really good support, on or off the pegs. Light pressure on the shifter is felt, but the top pad does its job in absorbing the pressure and preventing undue wear on the top of the boot. A late morning walk of about 3 kms was comfortable from start to finish and again, it was as if wearing a trusty pair of well worn sneakers. Outside of a little creep in the shoe, caused by a poor choice in sock, nothing else jumped out to bear noting. Care and maintenance is minimal ‘ wipe them off now and then to keep them looking good. A light coating of a compatible waterproofing compound can be applied to help protect the boot, and your feet, from the wet stuff. The insole is easily removed for washing or replacement, and according to the label instructions, the shoe itself is machine washable. From my perspective the boots are the type of footwear that would be acceptable almost anywhere. Stylish and attractive, they also don’t look like boats on me, something I can’t say about other similar sized footwear. Composition of the boots: leather and fabric combination, mesh panels for ventilation, rubber sole. 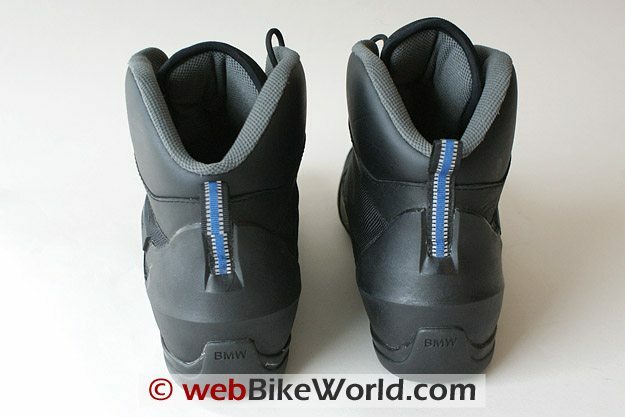 Although a new owner, I already covet my BMW Sneaker 3 Boots. They do carry a price premium that is the norm for many BMW products, especially accessories. But compared to other products tried and their evident quality, I can live with a higher initial outlay. I’m sure the return on investment will be worth it. Designed for strength, comfort and an understated look, the boots seem to be just what BMW intended them to be: a comfortable lightweight pair of boots that can be worn for short trips. That means something like to the corner store or when some low speed runs around the rally site are in order and for all day hikes or farkle acquisition expeditions. I have a hunch my ‘sneaker boots ‘ are going to get a lot of use and will be a constant part of the travel load. 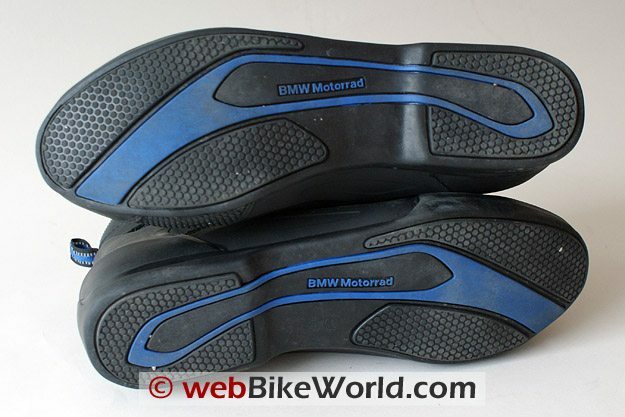 Like my original Triumph Tritech boots which over the course of six years have survived a lot of lickings and still keep on ticking, the BMW Sneaker 3 Boots could be a long term relationship — I hope so. From “P.N.” (6/10): “Love these boots, ordered my size [9.5] found they fit snug and were a bit hot to wear. Noticed a small tear in the one boot, went to dealer and they exchanged them on the spot. 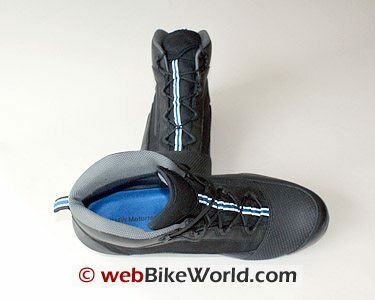 From “A2” (3/10): “I am on my second pair of these boots they are no doubt extremely comfortable on and off the motorcycle. Wearing them is akin to the feeling of any quality high top sneaker. From “M.S.” (7/09): “I occasionally help out at weekends in sales in my local BMW Motorrad dealership. These boots are perfect for standing around in the showroom all day and for shuffling bikes around the premises. I don’t think I’d be inclined to wear them for longer trips, although our Sales Manager has been known to commute the 50+ miles from his home in them…..on his Yamaha R1. I think the only feature you missed is the pocket on the outside top of the tongue which is designed to enable you to tuck the tied laces in out of the way of getting caught on foot pegs and gear and brake levers. From “Z.G.” (7/09): “I absolutely hated these. When my original BMW Street Sneaker 2 finally worn out, I was disappointed to find out they don’t make the original one any more. It was full leather, super light weight and very breathable. I was introduced to the new Street Sneaker 3, where I made the mistake of thinking it was gonna be better. At first glance you would think the synthetic fabric makes it more breathable thus more comfortable in summer and walking. But no, my feet sweats like hell walking around or just sitting still there. The only way to keep my feet comfortably dry is to ride. The fabric is supposed to let air through more easily, but the extra layers just makes it much hotter inside. The old full leather construction of the Street Sneaker 2 lets more air breath out. To me that’s more important for a pair of boots named ‘sneaker’ for everyday use. 2nd problem with these boots is that they get soaking wet in no time. There is nothing to it. most leather boots can hold up for a while. The Street Sneaker 2 was very good in that regards. But these synthetic ones are absolutely useless. If you go over a pothole of water, the splash will soak your boots.